Indeed. Football season is over. It was a heavy hearted Super Bowl here at Owl Farm. The kitchen was filled as always with loved ones and fellow gamblers, pretty girls, drinkers and lawyers. I have kept the house basically frozen in time since Hunter died a year ago and every day brings in a new angle to the loss. Acid wit. Gonzo journalist. Enigma. 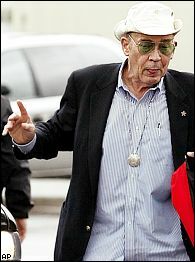 Hunter S. Thompson was described in many ways during a career that left an indelible mark on American arts and letters. Watching our first Super Bowl without him, in this very familiar environment, anticipating the absolute worst, I reached, as usual, for the comfort of his words. I picked "Hey Rube" for us to read out loud. And it brought back some fantastic memories that we shared with all of Hunter's readers and the staff at ESPN. I remember when John Walsh, Jay Lovinger, and Kevin Jackson flew out to Woody Creek in the autumn of 2000 to propose a weekly column. Hunter of course loved the idea of working with his longtime friend John, and was only slightly skeptical of the others. He wasn't sure if he wanted to write for (A) the Internet, and (B) such a huge company. What followed was a flow of weekly columns that broke a very vague writer's block that had plagued him for over 10 years. He cherished his column, he grew to love the staff at ESPN deeply, and most importantly he developed a renewed faith in his readers. If you are reading this note, very likely you were a Hunter Thompson reader. And I hope you understand how much confidence he started to have in the younger generation, and how effective sports lovers could be in taking charge of their own environment, just as music lovers were when he wrote for Rolling Stone magazine in the '70s. He wrote FOR and BECAUSE OF his readers. And later on believed that sports people are also an incredibly powerful group. The purpose of reaching out to you after the Super Bowl is to thank you for all your letters over the past year, and for the support from friends and family. I especially want to bring your attention to something very important that happened since Hunter died, and which he first involved you in five years ago. Remember young Lisl Auman? The girl who was convicted of murder and sentenced to prison without the possibility of parole, for a crime she did not commit?